Why we need to stop telling women this was the birth they ‘had to have’. 18 years ago, I became mother to a plump little person who emerged from the fiery depths of a traumatic birth, and initiated me into motherhood. The impact of that birth shook me to the core. It rippled out and affected every part of my life including my relationship with my partner, my relationship with my baby, and of course, my relationship with myself…not to mention my relationship with birth! I have clawed my way out, and healed, and had two positive births in the years since. And I have noticed a few themes in the responses I get from people when I mention that I had a traumatic birth. One that continually irks me, is the suggestion that this was ‘the birth I had to have’. Traumatic births are NOT necessary for personal growth. Can we just all be clear on this? I did NOT need that birth for personal growth. Other women do not need traumatic births for personal growth. It’s just ridiculous to assume that a particular woman needs to experience fear, confusion, horror, despair and leave the hospital feeling like a wreck, for personal growth. I DID need personal growth – that’s for sure. But I didn’t need the baptism of fire by birth trauma to get that growth. I didn’t yet realise, when pregnant with my first child, that the path to birth is an emotional journey, as much as a physical one. And that this growth leads us to be the mother we need to be for each child. I thought it was about planning a nursery, cute outfits for the baby, choosing a pram, and getting used to the physical changes. I didn’t know that the pregnancy was an opportunity to explore my understanding of myself as a woman, as a mother-to-be, as a daughter, as a parent, and to reflect on my perceptions about birth, my relationship with myself, my relationship with my partner. I didn’t know that my findings as a result of those explorations might lead me to make different decisions, choose a different form of care, communicate different needs to my carers or have a different set of goals for my birth. I didn’t know that the pregnancy and birth were an opportunity to find the woman within me who would be this child’s mother. Now I know that there are more enabling and empowering ways to access and harness this unfurling of the mother within. She does not need to fight her way out of mental confusion, horrific flashbacks, feelings of hypervigilance in her parenting and a lack of bonding with her child…to grow as a person. Although experiencing those things CAN provide growth as a person. I have grown in so many ways as a result of my traumatic birth. So I want to make that clear too : we are not saying that you can’t find personal growth as a result of birth trauma. I certainly have, and we’ve supported so many women over the years, and they definitely have too. But it is important to consider that maybe there is another way to learn the lessons needed for mothering – one that does not involve trauma. For 15 years, my sister-in-law (a former midwife) and I have been running Birthtalk.org, a support and education organisation where we specialise in supporting women who have had a traumatic birth. Our antenatal sessions called ‘The Path to a Better Birth” have been filled with a combination of first-time parents, and those birthing again after a traumatic birth. These first-time mums did NOT need traumatic births – not one single one of them. But they still often needed personal growth. In our sessions they grew, and reflected, and challenged themselves, and asked the difficult questions, and sometimes cried, and revealed deep personal truths about themselves, and faced – often with brutal honesty – their humanness. And they grew. Their bellies grew, and their minds blossomed. And they became the mothers they needed to be for their babies. Without trauma. And as we explored what makes a good birth, and what makes a negative birth, usually, this process clarified their needs for this birth. Couples often grew closer as they realised the potential impact birth could have. Communication between them became about how to stay empowered, how to support the mother’s emotional space, and thus support her physical process. And maybe resulted in a change of plans for the birth in terms of birth setting, health carer or support people. Most of them went on to have positive empowering births. Some of these were not straightforward or did not follow the expected/hoped for path. But very few of these women (or their partners) emerged feeling traumatised. They emerged ready for parenting, touched deeply and positively by the birthing process, aware of the strengths that had evolved through the pregnancy and then the birth. They still may have had their struggles postnatally, but were grounded by the power of being empowered through their birth. Of course, I can’t control certain things about birth. And dramatic unplanned things happen. But that was not my story. My story was not dramatic, life or death. It was a result of system issues, and staffing issues and cultural issues about what a woman needs for birth. And even if it was life or death – I don’t believe that it is beneficial for the baby’s journey if the mother is not well-supported emotionally and ends up traumatised. In my own case: I refuse to believe that this was the journey my baby ‘had to have.’ My baby did not deserve a broken woman as his mother. I refuse to believe that this was the journey my baby ‘had to have.’ My baby did not deserve a broken woman as his mother. We didn’t need an experience that affected my ability to bond with my child (which is very common after a traumatic birth, due to the messed-up hormones and being separated and feeling like you’ve been run over by a truck). We didn’t need an experience that compromised my hormones so that breastfeeding was a nightmare – something that is also common but I didn’t know that then (read why breastfeeding can be so hard after a traumatic birth here). My son did not need that. He needed me. At first, I used to think this traumatic experience was the journey I ‘had to have’. This was part of me trying to find a way to make it okay. To feel that there was a reason for my pain and struggles and challenges made it somehow less of a blow. But there was no reason for it. I did not need that kick up the bum that I thought I needed. Not like that anyway. I needed different information about what women need in birth. And to be honest, I also needed some humbling as part of my growth! In my first pregnancy, I was so sure that birthing was another chance for me to be successful! I’d always excelled at things I put my mind to, so this was another chance to show my prowess at whatever I turned my hand to. And my vision of ‘success’, back then, was a drug-free vaginal birth, preferably quick. I ended up with an un-elected caesarean after 30 hours. So, yes, that was humbling. But there have been first-time mums in our Antenatal sessions whom I have seen move through a similar series of awakenings, realising that they have to take themselves “off the stage”, that birth has no place in a competitive arena, that this is an intimate journey between the woman, her baby, and her partner. I’ve seen them, during our course, realise they needed to take the word ‘success’ out of birth. And the word ‘failure’ too, for that matter. And they learn. And they are humbled. And grow. Without trauma, although perhaps with some angst and pain as they self-reflect. And they then use this new-found knowledge to help them in planning an empowering experience. If I accept that I needed that birth then does that mean that other women need their bad births? And that by trying to prevent traumatic births we are somehow robbing women of the learning experience they would have had from a traumatic birth? That’s pretty much what is being inferred – if unintended – that birth trauma is something that some women need as a ‘kick up the pants’ to get them to a place of new understanding and self-knowledge. Rubbish. Absolute rubbish. If traumatic births were ‘meant to be’ or the birth some women need to have, then why have any antenatal education at all? Why promote antenatal classes of any kind, if we believe that it is important and necessary for women to get the birth they are ‘meant to have’ anyway? The answer is because we know that birth matters beyond getting the baby out. And because we know that an informed woman making informed decisions in birth can potentially impact not only the path of her labour, but also her emotional outcome. And because YES pregnancy and birth are meant to prepare a woman to mother her child. But not in a tumbling mess of an event where she is unsupported, feels unsafe, is perhaps disempowered, is robbed of her dignity, or has her questions ignored. And if she knows that…she can take steps towards a different experience. I remember during a session in our “Path to a Better Birth” course, a woman, preparing to meet her first child, began to quietly weep. When we asked if she wanted to share what was happening for her, while her husband held her gently, she shared, “It is just so IMPORTANT. I am beginning to see now that how I experience this birth is SO important, and it matters so much to everything that comes afterwards.” And went on to share that she was realising that she needed to do the emotional work and face her fears, and reflect… she couldn’t just sit back and wait for this birth to be upon her. Our course gave her the awareness, the information and understanding plus the support to be able to do the work that she needed to do. And her husband gained the information to know why this was so important and what he could do to support her. So she did the work. And had a beautiful birth, with her husband able to provide wonderful support. With much positive personal growth. And she is not the only one we’ve seen take that journey. It’s actually GOOD to know that your traumatic birth was not necessary for your personal growth. See – if you’ve been told that this was ‘just the path you must have needed to take’, then it can feel a bit ungrateful to feel…ungrateful. To feel angry, and like a failure, and sad, and confused and ashamed (common responses to a traumatic birth) is tricky when you are being told that you ‘needed’ this birth. And has led to women, including myself, beating themselves up, wondering what they did to deserve such a horrific start for themselves and their baby. What deep terrible nature did we possess that needed sorting out in such an inhumane way? But if you KNOW that you didn’t need it…then you are FREE to be angry (and work through that) and grieve for that birth (that you KNOW didn’t need to be that way) and ask all the questions needed to clear your confusion (and thus gain clarity about what happened) and clear your feelings of shame (and we have never met a woman yet whose shame about her traumatic birth was justified, just so you know!). You can release the pressure on yourself. I have worked so hard to heal from my traumatic birth. To mend my relationship with my son, with my husband, with myself. Even to mend my relationship with BIRTH, so that I could face going there again. I have since had two wonderful, empowering, positive births. Each subsequent pregnancy took me on a journey, sometimes on a path I did not want to take, but ‘going there’ offered gifts. My second and third births were challenging, painful, intense, with periods of euphoria, joy and bliss thrown in as well. I emerged from them emotionally safe. Due to fabulous support, improved birth education, plenty of self-reflection and personal growth and a different model of maternity care. Actually, I emerged from these births emotionally enhanced. I was able, with these births, to gain all the wonderful blessings birth has to offer whatever path it may take. Gifts of strength, feeling centred, confident in my mothering, grateful for the journey, ready for anything. My first birth also had gifts. I just had to fight so very hard to find them in the aftermath of that event. They were deeply buried under the grief and the guilt, the shame and the isolation, the feelings of failure and the shock. I could not find them until I had processed all of these normal responses to a traumatic birth, and had moved on. I saw a quote by author Andrea Dykstra, who writes, “In order to love who you are, you cannot hate the experiences that shaped you.” I don’t feel hate towards my traumatic birth. I don’t feel anger or bitterness these days. Or shame. My birth trauma may have shaped me, but it doesn’t define me. I have healed. I have grown. But I am so grateful be at the point where I know that I didn’t need that birth to be the woman I am. And that other women don’t need it either. This is what drives us, at Birthtalk.org, knowing that women do not NEED traumatic births. So we educate, and we support and we guide and we promote an understanding that there is an awful lot you can do to work towards an empowering birth, regardless of the scenario. 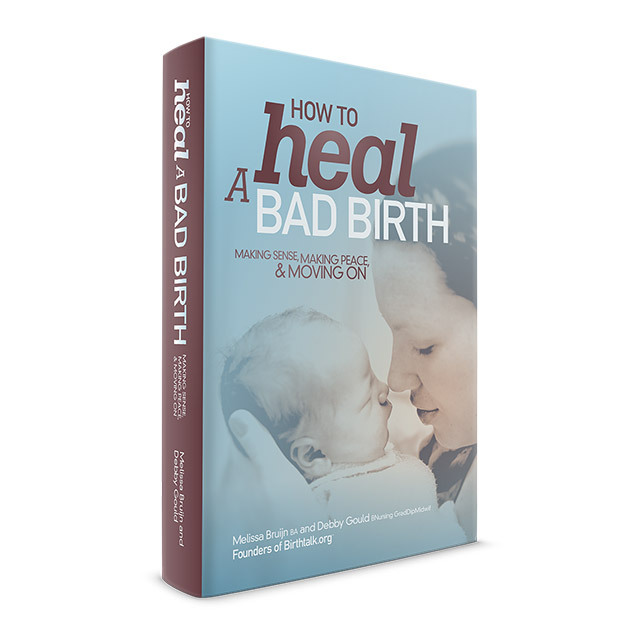 And of course, there is a lot you can do to heal from your traumatic birth: to grieve, to process, to express emotions of anger/shame/guilt and more that can arise, to develop a new understanding about birth, to be held gently in a safe space while you explore your experience. And yes, there is huge personal growth possible. But, just so we’re clear, you didn’t need it to come from birth trauma. Thank-you for writing this article! It is one of the most hateful things these days that people are told that their trauma was meant to be and so on…..I rage against such platitudes but struggle still with the shame I feel for “letting it happen” to me. You put it all so well. We all need to grow but perhaps do not need that level of suffering to do so. ← “She Believed She Could” – why this saying has no place in birth.